From attention grabbing gameshows to the event takeover of RFID wristbands, Ice relishes the yearly challenge of the Dixons Carphone Conference. This year was another tremendous success in the creation of an O2 stand that drove engagement and presented the brand’s consumer offerings to store managers of Dixons, Carphone Warehouse, PC World and Currys. With no time to waste, Ice took on the challenge to create yet another outstanding activation with a brief to deliver an original and captivating stand that highlighted the key benefits of O2 Priority. Held at Liverpool’s Exhibition Centre with over 1,800 senior managers in attendance, the ask was to create a winning stand and unmatched experience for delegates that would steal the show from the other exhibitors. The Ice team got straight to work and created a custom-made prize mechanic acting as an immersive platform in which to share the features of O2 Priority. 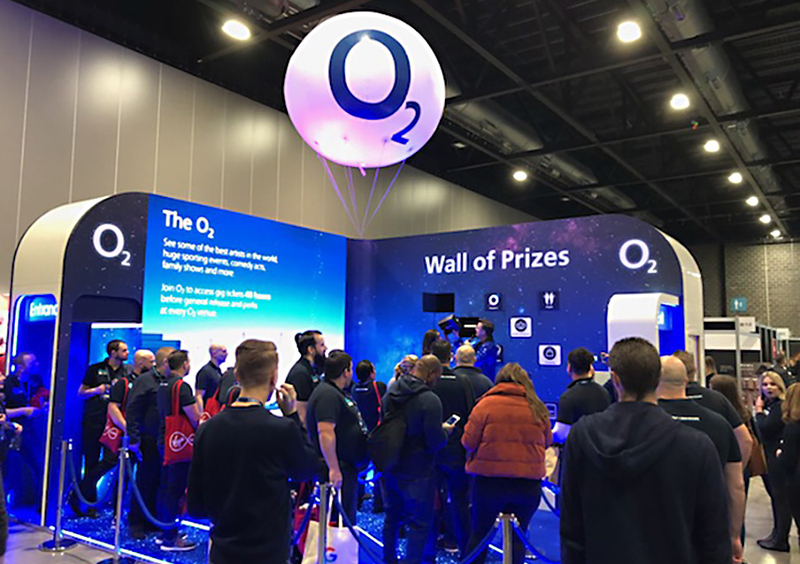 Showcasing the latest O2 brand assets for the campaign; “Breathe it all in”, a beaming cosmic wall of Priority prizes took centre stage enticing passers-by. As each delegate approached, they were greeted by an O2 angel and offered a lanyard laminate brimming with memorable takeaways detailing the core principles of the O2 brand. Once they had stepped up to the top of the dazzling O2 “blue carpet”, guests were invited to take part in the O2 Priority Wall of Prizes by answering a question about the O2 brand to win a sought-after prize. Winnings were inspired by O2 Priority app favourites featuring Café Nero vouchers and Thorntons chocolates as well as a select few “Star Prizes” which gave participants the opportunity to win Apple Air Pods or even a pair of gig tickets to an O2 Academy. The signature Ice blend of brand awareness, user experience and shareable event content created a memorable experience for participants at the Dixons Carphone Conference 2018. Following the success of the brand activation, an evening of entertainment was hosted in the bespoke-made “O2 Bluebar”. A space complete with balloon archways and edible mist orbs for guests to enjoy and celebrate the day’s event. Every year, the Ice team work hard to create an overarching experience for guests to the Dixons Carphone Conference, strengthening the relationship between delegates and the O2 brand. An integrated event with a brilliant user experience and impactful outcome, the approach by the team at Ice goes beyond the corporate framework of a trade show, creating a balanced, experience-led stand building the core messages of the O2 brand into its structure. We just can’t wait to see what 2019 might have instore!